Directory of Maritime Museums at the Council of American Maritime Museums. Howard Steamboat Museum The mission of the Museum is to preserve the Howard family story, their mansion and the history of their shipyards and to foster an appreciation of the development of river steamboats and commerce along inland rivers. Jeffersonville, Indiana. John Wesley Powell River History Museum - powellmuseum.org. Visit to find river history, including a model of the Cliff Dweller, and a short history (copied to this site, click here). Photos of the river section of the Powell are posted at this blog: southwestbrowneyes.com. L.A. Maritime Museum Focus on the ships and history of the L.A. Harbor, located in the old ferry terminal on the San Pedro waterfront. Ship model collection. The Historic New Orleans Collection The Historic New Orleans Collection (THNOC) is a museum, research center, and publisher dedicated to preserving the history and culture of New Orleans and the Gulf South. Upper Tennessee Riverboat Museum, Inc. This new museum will preserve artifacts, records, and accounts of riverboats on the Upper Tennessee River and its tributaries above Muscle Shoals, Alabama. Museum is located in Knosville. Timeline of Ships, Boats, and Yachts the timeline starts at 4000 BCE and goes through 1990. Marietta, Ohio Visit the Ohio River Museum, associated with the Ohio Historical Society and the Sons and Daughters of Pioneer Rivermen. University of Alberta Search the University archives' northern records project. Includes records of Julian Mills, a steamboat captain in the waterways of Norhtern Alberta. Links to a numerous historic photos of early 20th century northern Alberta shipping (including steamships). San Francisco Maritime National Historical Park part of the National Park Service. SteamboatEraMuseum.org located in the heart of the Northern Neck in Irvington Virginia between Kilmarnock and White Stone in Lancaster County. ppRiverMuseum.com Point Pleasant River Museum in Mason County, West Virginia. MillerCountyMuseum.org put "steamboat" in the search engine to access all articles about Missouri steamboats. Mississippi River Museum & Aquarium visit the steamboat museum in Dubuque, Iowa, a project of the Dubuque Historical Society. Steamboat Arabia Museum museum in Kansas City, MO, displays recovered artifacts from this steamboat that sank in the Missouri River in 1856. Cincinnati Library find photos of steamboats in alphabetical order. Cincinnati Union Terminal Station explore the museum, including the History Library and Archives. Steamboat Era Museum dedicated to preserving the history of steamboats that served the Chesapeake Bay and its tributaries. Mississippi River Adventures Official Mississippi River Travel, Vacation, and Adventure Resource! "If its on the River its on our Site"
Online Steamboat Museum At This Site - Information and hundreds of photos. University of Rochester - great documents, photos and technical drawings related to steam power. Search their archives. The Nautical Research Guild list of nautical museums worldwide. Do dogs and boating go together? Mysticseaport.org thinks so. Life on the Water Magazine a resource for people who love the Tennessee River and surrounding waterways . . . and for the people who long for its adventure, solitude, and rest. The steamboat fonts we use at Steamboats.com come from a Dover CD-ROM book, "24 Circus Display Fonts." Buy it at Amazon, click here. The Great Lakes Maritime History Collection More than 1,000 records (including images, video and other related documentation) about barges, cargo ships, lake steamers, lighthouses, passenger ships, river steamers, schooners, and shipwrecks. Located in Madison, WI. Railpub - The source for back issue steamboat and marine magazines, plus used steamboat, railroad, tractor, truck and transport books. Delta Queen: A Novel, by Charles Bowen. International Steamboat Society - Steamboating Magazine at Steamboating.org Initiated in 1984 for the purpose of forming a link and a means of communication for the many steamboat enthusiasts throughout the world. The Society is open to anyone who owns, will own, has owned, or simply has an interest in steamboats. Link here to learn about monthly journal, Society membership. Steamboat Bookstore For books on steamboats - at this site! Reading list and publications. Topmost resources for steamboat information (at this site). Now available - new 20 page illustrated catalog of riverboat and tug plans from Paddlewheels and Props. Plans for 39 river craft are listed, including vintage steam paddlewheel passenger vessels and towboats, early diesel stern wheel and prop towboats, barges, auto ferries and modern towboats, many designed by Ward Engineering Works of Charleston, W. VA. Also listed are 7 harbor tug plans dating from 1910 through world War II. There are 4 pages of sources for other plans, historical societies and publications and model building supplies. If you are a ship model builder, river artist, historian or just a boat buff, you will find this catalog useful. Steamboat Dave Dawley's Place Alphabetical Links to boats, captains. Links to info. on Alaskan riverboats, Rio Grande riverboats, fun riverboat links, books on riverboats. Georgetown Steamboats - revisit the steamboating days of 1850-1870 with historian Fran Nash. This is an intense historical site with local stories, steamboat and steamboat captains' biographies. All the stories are centered around Georgetown, PA, mile marker 38.9 from Pittsburgh on the Ohio River. Lee Line Steamers Telling the history of the Lee Line Steamer Co. 1862 to 1926. SteamboatExplorer.org Chesapeake Bay during the Steamboat Era - on Youtube. MoRiverSteamboats.com A Brief History of Steamboats of the Osage River, by Margaret Gilbert, steamboat historian. Steam Engine History Find info. on the development of the steam engine - at this site - with links to other resources. Delta Queen Ghosts a the Ghost Lab investigators were so rude to the ghost of Mary Greene. It was awful. If ghosts can get scared or angry, Ghost Lab did it to the honored ghost of the first woman steamboat pilot, Cap'n Mary B. Greene. Wreck of the Montana sunken paddle wheeler in Bermuda. To find photos of how it looks now, click this Google link, then hit return to search these key words:Google Image search There are a couple of paddle wheel wrecks in the coral reefs off Bermuda - yes they had ocean going paddle wheel boats in the 1800s. One is the Montana, the other is the Marie Celeste. 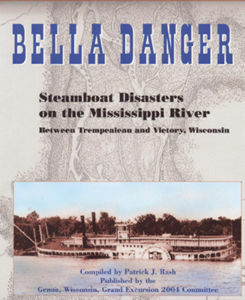 To find books on steamboat disasters, go to our onboard bookstore: Steamboat Disasters. Historync.org North Carolina Business History -This site has the most comprehensive historical list of steamboats that plied the waters of North Carolina, including detailed lists (type, tonnage, draft, routes, etc.) as well as some pictures, steamboat lines, etc. -- with more to be added. History of steamboats in North Carolina. Go directly to the steamboat page: Steamboat History at the North Carolina Business Hall of Fame. The Great Steamboat Race of the Kentucky Derby is a real steamboat race that has been going on for 40 years and traditionally features the Delta Queen and the Belle of Louisville. Towboat swept under bridge See amazing photo sequence of a towboat that washes under a bridge in Alabama in 1979. American Rivers and Waterways - American migration was often by way of rivers and waterways. These are as important to study as are the early roads and trails. This nicely done site also links to related web pages. The Ghost of Mary Greene the first woman to pilot steamboats lives on in the legend her ghost lives on the Delta Queen Steamboat. At this site! GreatRiver.com Mississippi River Heritage, Natural History, and Recreational observations from author Pat Middleton. New book (now available!!) a good resource for boats operating between Cincinnati and Louisville between about 1910 to 1930 by Russ Ryle. Available in September - a new CD of riverboat music. Boats of Winfield, Kansas, and the Cowley County Area historic photos, info. Steamboats in Petaluma Read about the history of steamboats in this California town. First day cover collection from the Delta Queen At this site! Steamboat Clowns Cory the Clown and Aaron Neville visit New Orleans and Cory travels on an actual steamboat. They explain the history of steamboats. Watch for their children's TV show on PBS. Bauer Interiors - examples of steamboat interior design, including the Delta Queen, Mississippi Queen, and other great boats. Based in New Orleans. RiverHistory.com Learn more about river history, steamboats, and how they shaped the nation. Bodine Balasco named one of the Top 21 Speakers for the 21st Century. His Fortune 100 clients include AT&T, Boeing, Coca Cola, British Petroleum, Verizon, Wells Fargo, and FedEx. Last of the Riverboat Gamblers at the Magic Castle and Delta Queen steamboat. BobLoSteamers.com A Tribute to the Bob-Lo Steamers. Oklahoma History Center Project to excavate the Heroine, a sidewheeler sunk in 1838. Model is on display. Yolo Shortline offers scenic train rides, departing Old Town Sacramento.